Stock market volatility continued today, with the S&P 500 index and all other major U.S. equity indexes either approaching correction territory or already in it. The increase of the volume during the sell-off is disconcerting and may indicate deleveraging by large hedge funds and institutional investors. As the equity market correction has been unfolding, in previous articles I have highlighted the “falling knives”, the investment areas that prudent investors should avoid. The two weakest investment areas continue to be Euro stocks and energy/natural resources sectors. Relentless selling has caused tremendous drops already. Consequently, I would not be surprised to see a violent relief rally taking place in these highly oversold markets in the near future. While equity markets experience their first serious disruption since the panic of the August 2011 credit-rating downgrade of the U.S. debt, it is worth taking a look at other financial markets, as well. 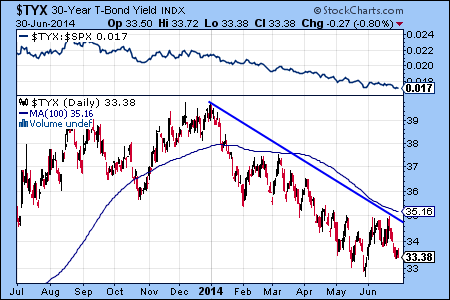 Most notably, and unexpectedly, interest rates of the long-term Treasury bonds continue to decline rapidly. Paradoxically, as the Federal Reserve has tapered off its bond-buying program, demand has increased for U.S. Treasury bonds, pushing the yield lower. However, this effect is exacerbated by increased reserve requirements for banks and, more recently, the “flight to quality” due to the equity market correction. Nonetheless, since financial markets often forecast economic conditions 12 to 18 months into the future, the rapidly declining interest rate of long-term Treasuries is probably not a good sign and may signal that the bond market is anticipating economic contraction in 2015 and beyond. One of the confounding factors of market action has been the rapid rise of the dollar against all major currencies from August through October. Many commentators have attributed changes in the market to the strengthening of the dollar, however, since the beginning October, the dollar has pulled back and no longer appears to play a key role in determining stock market dynamics. A further weakening of the dollar from these levels could potentially help U.S. multinational companies to report improved earnings in early 2015.
Commodities, as a group, have experienced a huge deflation since July. Energy and metals are the weakest, while some agricultural commodities are showing signs of bottoming out. Perhaps the only silver lining in the commodities space right now is silver, and of course gold, as these two metals are highly correlated. After a devastating decline staring in September 2011, gold bullion bottomed out in July 2013 and has been in a wide trading range ever since. I’d like to highlight here two conservative investments, which have worked well throughout 2014, regardless of market volatility. The first one is the Fidelity U.S. Bond Portfolio (FBIDX). FBIDX is a highly diversified bond fund that is appropriate for conservative investors. My top pick for the current market environment is the Fidelity Spartan Municipal Income Fund (FHIGX). Its low volatility and a tax-equivalent 3.55% yield continues to make FHIGX a very attractive investment choice. A word of caution for bond investors: unfortunately, not all bond funds have done well since the market correction started. High-yielding corporate bonds tend to track the stock market trends more closely than the interest rate trends, and are in a decline now. The stock market sell off yesterday caused all Fidelity select sector funds to decline. As we approach the often volatile fall season we are not surprised to see investors reducing “risk on” investments. To identify the weakest sectors we use relative strength that measures the performance of a given investment compared to the S&P 500 index. One of the weakest Fidelity funds based on this measure is the Select Materials Portfolio (FSDPX). The top panel of the FSDPX chart below shows that the relative strength is declining at an accelerated pace (see blue line). This suggests that the net asset value of FSDPX can decline more rapidly than the equity market in case of a continued sell off. Ahead of the July 4th holiday, the Dow Jones Industrial Average briefly reached the all-time high 17,000 level, but was not able to hold it this week. 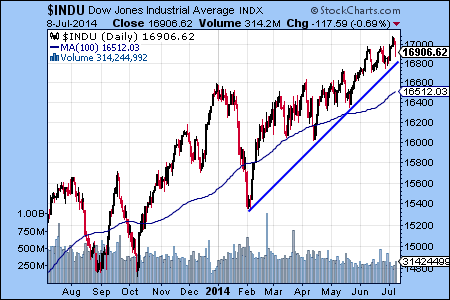 The chart below shows that the Dow is still in a bullish uptrend, but what makes us concerned is the more severe sell-off in market leading sectors, such as biotechnology. We are also approaching the seasonally weak fall period. Since many of the infamous stock market crashes occurred between September and November, we caution our readers to be increasingly careful with committing new funds to “risk on” investments. The biotech sector has been one of the market leaders in the last 18 months. The chart shows that the sector corrected hard from the March highs in April and May, but was able to rally back in June. 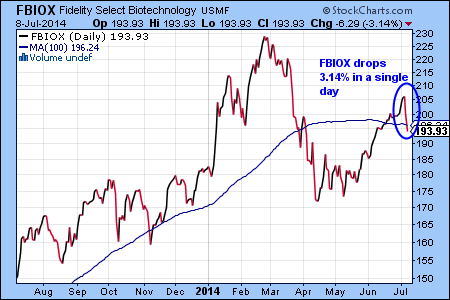 The large 3.14% drop of the Fidelity Biotechnology Fund (FBIOX), which is the largest biotechnology fund available to investors, is concerning, because it may signal the start of a market correction. While aggressive equity sectors got hit hard today, long-term Treasury bond rates trended lower, which helped interest rate sensitive investments to go higher. 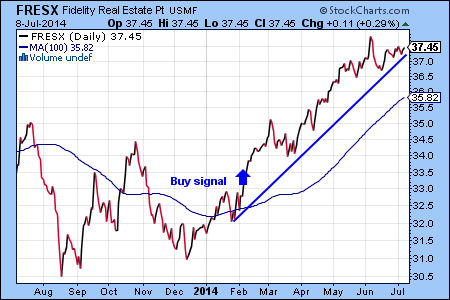 One of our current favorites in this space is the Fidelity Real Estate Portfolio Fund (FRESX). FRESX was one of the few Fidelity funds that posted a gain today and we would not be surprised to see FRESX to hold its current bullish trend even if stock market conditions weaken. Emerging market economies are known to experience cycles of boom and bust. The boom periods can be highly rewarding for investors by producing double or sometimes even triple digit gains, while the bust periods tend to make risk averse investors exit these markets and seek out low-risk investments. Declining interest rates, market friendly Fed policies, slow and steady economic growth, increased risk tolerance by investors and renewed appetite for investments with outsized returns have created a new bull market in emerging market equities in late spring. Our favorite fund in this space is the Fidelity Emerging Markets Fund (FEMKX), which have produced stellar returns since its inception in 1990. Value investing is a time-tested strategy that involves identifying undervalued stocks with potential to grow. While many investors enjoy the research that is needed to find promising stocks, mutual funds are also available to make it easier to follow this strategy. 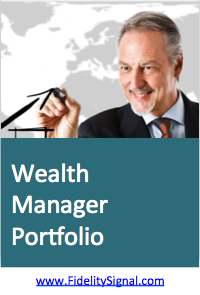 One of the best value funds available to individual investors is the Fidelity Value Fund (FDVLX). The low volatility market conditions have favored this investment approach since late 2012, and the management team at FDVLX continues to take full advantage of the stock picking opportunities in 2014. The salient feature of the bullish uptrend of the U.S. equity market this summer is low volatility. Most sectors are up since the last correction in February. The benchmark Fidelity Spartan 500 Index Fund (FUSEX) has returned 6.56% in the last three months. After three years of underperformance, emerging market investments are starting to outperform the U.S. equity market. Renewed interest in emerging markets is driven by multiple factors, such as rich valuations in some U.S. equity sectors, increased appetite for higher returns and pro-market government policies in several emerging market countries. For example, the recent elections in India resulted in a more than 20% rally. For conservative investors the Fidelity New Markets Income Fund (FNMIX) offers an excellent choice to invest in the international bond market. FNMIX currently yields 4.62%. The FNMIX chart shows that, in addition to the respectable income, significant capital appreciation can be achieved by investing in the FNMIX, as well. FNMIX has appreciated 4.65% since the April 1 buy signal that was issued by FidelitySignal.com. We think that both the fundamental and the technical factors are in place to support further gains.